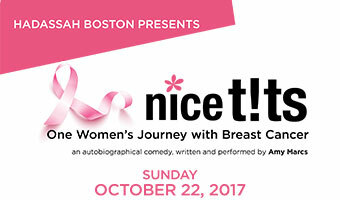 In honor of Breast Cancer Awareness Month, Hadassah Boston is proud to present a powerful autobiographical one-woman play, Nice T!ts, on October 22, 2017 at the JCC of Greater Boston. The play, written and performed by actress and breast cancer survivor Amy Marcs, is a comedy about surviving breast cancer. There will be a talk back following the performance with an oncologist and a reconstructive breast surgeon. The registration fee to attend this event is $54 per person. Please consider the additional donation options (Sponsor, Builder, and Friend) to Hadassah when paying your registration fee. In addition, you are encouraged to make a special $18 (Chai) donation in memory of the women we’ve loved and lost to breast cancer and in honor of the women who have survived breast cancer. The names of these women will be added to our program book. Thank you. Save 15% when you buy group tickets for 15 people or more. Please call Hadassah Northeast for details at 781-455-9055. Buy tickets here.